I don't get something about your mod logic, why people have to create .txt for each function they want to disable ? Why not just create a simple .ini file for customisation (just like all the most used ASI mods actually) ? I open the chatbox, i choose Cancel duel, okay ? 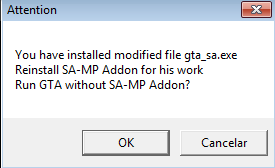 And last thing, can you allowed gta_sa.exe modified please ? How do I turn Frame Limiter on? Every time I turn it on, it turns back off. Thanks. Thank y'all, I enjoy this modification. why you need modified verios of this file? Can you delete when i type something in a dialog. Thats not save for the next dialog? I type in and press enter. Next time it comes the same text. When I used Win7 (Now Win10 64 bit) with older samp addon versions worked perfecly. Did you install correct gta_sa.exe? Does this work with SkyGfx ? how can i juste get the increase of drawing objects and transport? Any solution to fix it ? Thank you! Can you do a largeadressed version of gta_sa.exe ? Still not workin with SAMP Addon. "Ce mod permet à l'exécutable "gta_sa.exe" d'utiliser 4gb pour les architectures x64 et 3gb pour les x32, remplaçant ainsi la limite des 512mb"
Can use 4gb mem stream, i use this for my game, Is essential for me 'cause i have a lot of mod. This tool is a part of SilentPath 1.1. The setup version is not large adressed, my GTA freeze and close immediately when i spawn 'cause have a lot of mod. The unique solution is largeadress.exe for me. Do a version with largeaddress.exe !